The art of bespoke shipbuilding mastered by CRN, Ferretti Group’s brand specialising in the construction of super and mega yachts, is about to create a new masterpiece. The Ancona-based shipyard has indeed announced the sale of a new 62-metre fully-custom yacht - the shipyard’s hull no. 138. 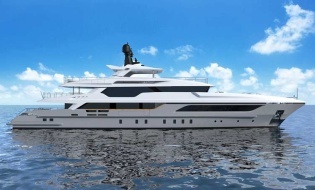 The new project has been developed by CRN’s engineering department in close cooperation with the Dutch design firm Omega Architects by Frank Laupman, who are taking care of the exterior concept, and with the Italian architecture & design firm Pulina DNA, in charge of interiors. Characterised by sporty and sleek exterior lines - Omega Architects’ distinctive design feature, CRN’s new fully-custom yacht skilfully combines the infinitely large – huge size and impressive perfomances – and the infinitely small, in the form of precious, functional details. The sale of this 62 m vessel is yet another success stemming from CRN’s long-standing cooperation with Omega Architects, which, in 2014, had already led to the creation of an iconic yacht like the 73-metre Yalla. CRN is currently building three other vessels: a 50 m M/Y CRN, to be launched in February, 79 m M/Y CRN 135, and 62 m M/Y CRN 137.